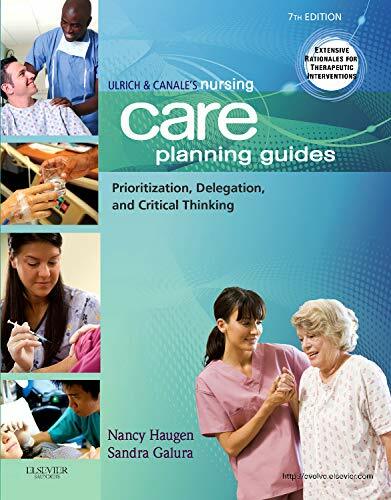 Learn how to create nursing care plans, effectively document care, and succeed in the course with Nursing Care Plans: Transitional Patient and Family Centered Care, Sixth Edition. 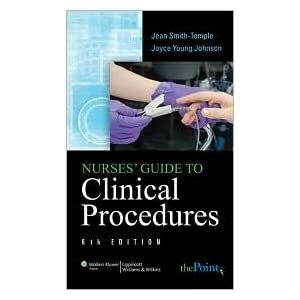 Easy-to-understand and packed with practical tools to prepare you for clinical practice, this proven book focuses on the nursing plans that are most important, ensuring that you learn what you need to know and that you can find the information you need easily, without being distracted by irrelevant information. This 11th Edition of Timby and Smith's best-selling text equips LPN/LVN students with the practical knowledge and skills necessary to provide safe and effective nursing care to today's medical-surgical clients. Acclaimed for its highly visual and easy-to-understand presentation, this edition prepares you to manage client nursing care in today's changing healthcare environments and eases the transition from classroom to clinical practice. Learn to perform specific nursing skills and manage client care using the Nursing Guidelines. Promoting safe and effective nursing care, Nursing Outcomes Classification (NOC), 5th Edition standardizes the terminology and criteria needed to measure and evaluate outcomes that result from nursing interventions. Nearly 500 research-based nursing outcome labels - including 107 that are NEW to this edition - help to standardize expected patient outcomes. Specific indicators make it easier to evaluate and rate the patient in relation to outcome achievement. "This is the first book to provide an in-depth exploration of strengths-based nursing care. It includes personal stories from practicing nurses and expert consultants using SBC, which enhances interest and credibility. It is filled with exercises and examples to help educators or nurses include SBC in their practice." 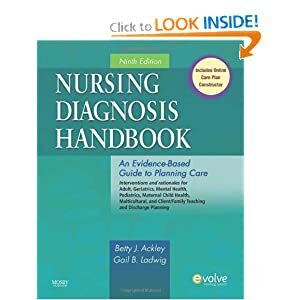 Nursing Diagnosis Handbook: an evidence-based guide to planning care by Ackley, Betty J. This resource can help you formulate nursing diagnoses and create individualized care plans. It shows you how to build customized care plans using a three-step process: assess, diagnose, and plan care. It includes suggested nursing diagnoses for over 1,300 client symptoms, medical and psychiatric diagnoses, diagnostic procedures, surgical interventions, and clinical states. According to the publisher: Practical and comprehensive, this essential resource helps you plan individualized care for clients in a variety of settings, including acute care, extended care, and home care environments. 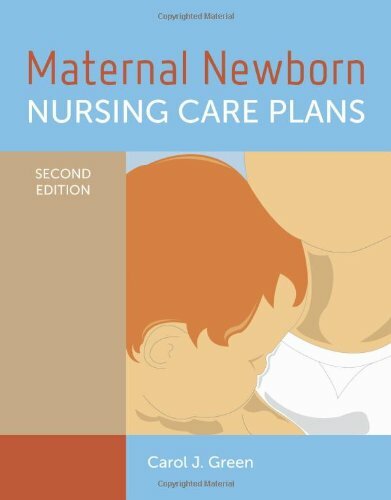 It features 33 detailed nursing diagnosis care plans and 65 disease/disorder care plans that are keyed to specific expected outcomes and interventions. This book also includes the popular Online Care Planner that allows you to edit and print standardized nursing diagnosis care plans. This handy pocket reference delivers step by step instruction on about 200 of the most commonly performed nursing skills. Each skill is presented according to its place in the nursing process and includes relevant information on required equipment, assessment needed, sample diagnosis, care planning, implementation, expected outcomes, and sample documentation. 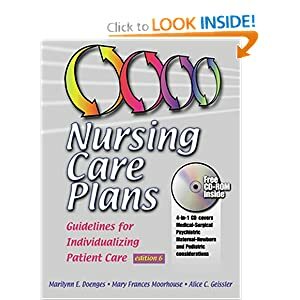 Nursing Care Plans : guidelines for individualizing client care across the life span by Doenges, Marilynn E.
According to the preface this book "is a quick-reference clinical-support tool... [that] explains the key steps necessary to perform nursing skills." Chapter 2 covers documenting and reporting for effective communication. Nurse's Pocket Guide: diagnoses, prioritized interventions, and rationales by Doenges, Marilynn E.
Provides a quick and convenient method for finding information on hundreds of care plans for 144 diseases and disorders. All-in-one reference to help you make sense of the complex world of health care. It features superior-quality definitions plus full-color illustrations. Encyclopedic entries explain more difficult concepts in depth appendixes contain practical quick-reference information. Careplans.com is the #1 online . resource for nursing assessment, planning, implementation and evaluation. This site includes tools, web applications, articles, links, and libraries to assist both caregivers and students in the careplanning process. Our extensive library of care plans have been developed by nurses, for nurses to assist in all areas of the care planning process. There is a $15 fee per month with a 3-month committment. Tool to create Nursing Care Plans without any handwriting task. You can try this software with a free 7-day download. If you decide to purchase it, it's a one-time fee of $29. This site was created by two Registered Nurses, who have over 60 years of combined experience in Nursing. Resources for individualized care plan guides and new care plans are provided monthly. Also customized care plans can be requested. There is a $11 fee for one month; if you committ to more than one month, it's dropped to $9 per month. This data is taken directly from the web site. The hypothetical nursing care plans are dated from 2009 - 2011. There are three pages of information listed in ascending date order (oldest to newest). This page describes nursing care plans and the information needed to complete one: "The foundation of any care plan is the signs, symptoms or responses that patient is having to what is happening to them. What is happening to them could be a medical disease, a physical condition, a failure to be able to perform adls (activities of daily living), or a failure to be able to interact appropriately or successfully within their environment."